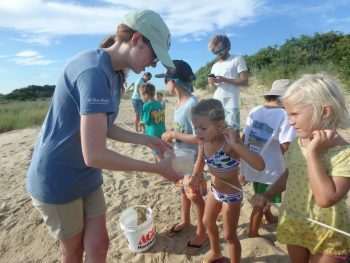 The North Carolina Coastal Federation’s Wanchese office has been busy this summer working with local community groups. Recently, staff helped to lead activities for a Kitty Hawk Cub Scout Troop. 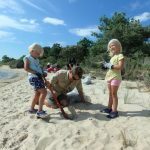 The troop and their parents visited a living shoreline at Jockey’s Ridge State Park. The group of 21 Cub Scouts, rising second through fifth graders, and 11 adults climbed the well-known sand dune at Jockey’s Ridge State Park and met up with the federation on the shoreline of the Roanoke Sound. 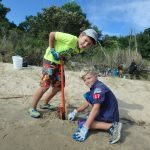 At the shoreline, the scouts learned why protecting shorelines habitats is so important and helped plant 600 marsh grass plugs, consisting mostly of salt meadow hay. The group also learned that the salt meadow hay was once harvested by some of the initial settlers on the coast, but it is now an important tool in reducing erosion and creating habitats. Gray Berryman, the scout troop leader, enjoyed leading his troop on such a unique experience. “The scouts had a blast and the programming was perfect for all the ages to learn something new,” Berryman said. After completing their servicework, the scouts spent time exploring and casting seine nets along the shoreline. 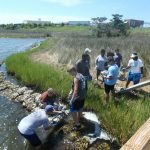 The water level was higher than usual, but the group was still able to find blue crabs, shrimp and comb jellies in the marsh waters. The northeast staff has also hosted a group from Elizabeth City, River City YouthBuild. 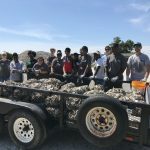 River City YouthBuild is a longtime partner of the federation, and this group of young adults visited the Wanchese office to help with oyster restoration efforts. 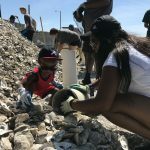 The group bagged oyster shells and ended up creating 100 bags. After the bagging, the group deployed these bags along the living shoreline at the Wanchese office. They especially enjoyed being able to get into the water for this activity. During their lunch break, a few members of the group had some time to fish off the end of the office’s dock. For many in this group, it was their first time visiting both Wanchese and Roanoke Island.